You see some fields of cotton Australia. 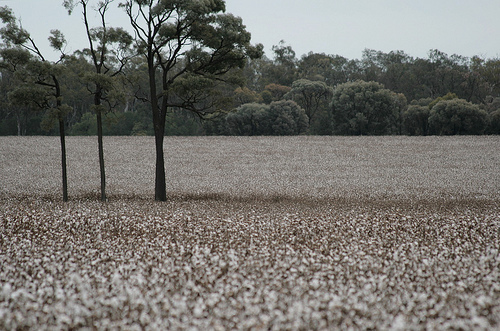 Australia is far from the largest cotton producer in the world, but is still the seventh largest. And you can see some fields on your travels in Australia. They are beautiful white fields, and many of them are found around the area between and around St George and Dirranbandi in south eastern inland Queensland. Cotton was brought to Australia with the First Fleet so its history is old by Australian standards. 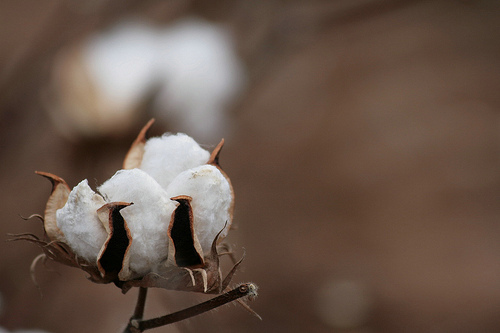 Cotton plant is a drought tolerant shrub that produces cotton fibre, and can also grow wild besides being cultivated. Where cultivated it is first grown on the fields, then harvested and taken to the Gin where it is processed (leaves and other parts are separated, cotton fibre is combed). The products have lots of uses from clothes to cosmetics, cotton buds and balls, to stock meal and paper, including money.